If you need to adjust the settings of a topic, occasionally, the simplest approach is to click on its Edit button. Scroll down, adjust the settings, and click on Post. However, if you need to adjust the settings of many re-usable or gradable topics, it’s much more efficient to work in Manage Topics. Click on Manage and then on Manage Topics to access this view. You will see a list of your categories and the forums under each, and how many gradable and re-usable topics each forum has. Click on a forum to access and manage its gradable or re-usable topics. 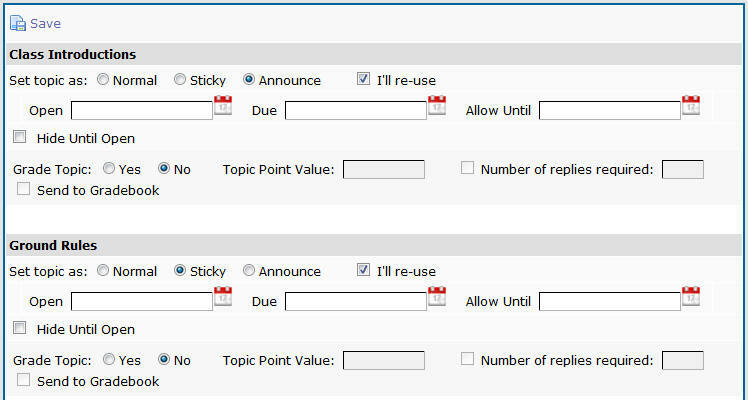 In one view, you an set or adjust dates, topic type, and grading options for all the topics of the forum.